Saginaw, TX - "Railfan Primer"
Please click any of the photos below to see a larger image. Looking for a hassle-free location in a friendly north Texas town to watch and photograph trains? Head for the town of Saginaw, a north Texas suburb located about 8 miles north of downtown Fort Worth. Just look for the grain elevators (along Business 287 about a mile north of I-820), and the rails which run beneath them. Saginaw's Chamber of Commerce, housed in a restored SP depot relocated from the central Texas town of Kosse, is located adjacent to the point where Saginaw's three main lines (two BNSF lines and one UP) intersect. Railfans are welcome to watch and photograph trains from the Chamber's parking lot or from the back platform of the depot itself. And the Chamber of Commerce is slowly developing its property into an interactive exhibit which will be known as the Saginaw Heritage Center and will celebrate the town's rail and agricultural heritage. A former Santa Fe caboose and modified former RPO car are already on hand, and the Chamber plans to acquire additional equipment in order to assemble a permanent "train in the station." Three main lines run through Saginaw. (Click here to see a map of Saginaw.) The two main tracks of BNSF's Wichita Falls Subdivision (the former Fort Worth & Denver main line to Amarillo) run through town from southeast to northwest. BNSF's Fort Worth Subdivision (former Santa Fe) from Gainesville to Temple runs through Saginaw from north to south.And Union Pacific's Duncan Subdivision (the former Rock Island line from Wichita KS) approaches town from the northwest, running parallel to the BNSF Wichita Falls Subdivision for several miles south from Hicks Airport. At Saginaw Interlocking, the UP line curves to the south to parallel the BNSF Ft. Worth Sub toward downtown Ft. Worth. Traffic on the BNSF lines consists primarily of coal, grain, mixed freight, and intermodal. 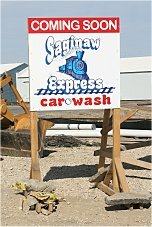 Many trains stop at the Saginaw Yard office, located about a mile south of the Chamber of Commerce depot, to change crews. Other trains operate via the former BN North Yard located south of I-820 and change crews there. 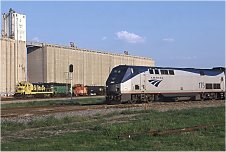 Also appearing on BNSF's Fort Worth Sub are Amtrak's daily Heartland Flyer trains, which operate between Oklahoma City and Fort Worth. The southbound is scheduled through Saginaw at 12:19 pm, and the northbound is scheduled for 5:37 pm. (The Flyer does NOT stop in Saginaw, however.) Additionally, UP trackage rights trains operate over both BNSF lines. UP's own line, the Duncan Subdivision, hosts mixed freight, grain, and rock traffic. Several rock trains originate daily at Chico, a small town approximately 30 miles north of Saginaw, where numerous limestone rock quarries are located. The southbound "fleet" often tends to hit Saginaw in the late afternoon or early evening hours. There is no connection between the UP Duncan Sub and the BNSF lines in Saginaw. However, UP and BNSF trains can switch between the various lines at the Tower 60 interlocking, located near the Stockyards district in north Fort Worth. Back in Saginaw, BNSF trains can transfer between the BNSF Fort Worth and Wichita Falls Subdivisions through a connecting track located just east of the interlocking. This track is eqiupped with spring switches and is used primarily for yard transfers between BNSF North Yard and the newer Alliance yard (located along the Fort Worth Sub) several miles to the north. Additionally, a newer, CTC-controlled connecting track is located about a mile north of downtown Saginaw. Informally known as the Trinity Connection, this track allows Fort Worth Sub trains travelling either direction to access the Wichita Falls Sub, and allows trains arriving from Wichita Falls to head north to Alliance or south to Saginaw. Other noteworthy locations include the Trinity Industries car manufacturing plant (located on Bailey Boswell Road about a mile north of downtown Saginaw); BNSF's Roadrailer yard (located just south of I-820 along the west side of Saginaw Yard); and the elevators themselves, each of which owns and operates one or more switch engines. The Attebury elevator, located north of the interlocking, owns a pair of high-nose geeps. ConAgra operates former Denver & Rio Grande Western SW1200 # 134 at its elevator south of the interlocker. And Cargill's Horizon Flour Mill, the large milling complex located near the north end of Saginaw yard, normally has two Rescar CF7s on hand. Each of these locomotives are located on private property, but might be visible (and thus, easily photographed) from public property as they go about their switching duties during the course of a typical day. As for the elevators themselves, the Attebury and ConAgra elevators are the largest in the state of Texas, providing capacities of 21 million and 15 million bushels, respectively. These north Texas landmarks can be seen from all over northern Tarrant County. BNSF's Roadrailer facility, located in a portion of the former Santa Fe yard just south of I-820, is also worth checking out. Roadrailer trains normally operate five days a week in each direction between Saginaw and Kansas City. The trains normally operate at night, but sometimes deviate from their schedules and arrive and depart Saginaw during daylight hours. Norfolk Southern locomotives frequently appear on these trains. Hungry? 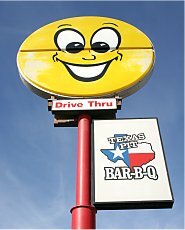 Saginaw features dozens of dining options, ranging from fast-food places like Jack-in-the-Box to full-service establishments like the excellent Texas Pit Bar-B-Q (just look for the large yellow "happy face" sign). Many restaurants feature a trackside view from their east-facing front windows. The Chamber of Commerce parking lot is a popular gathering place for fans. But be sure to check out other locations as well. Several public streets and overpasses provide additional opportunites to watch and photograph the action. AAR 36 (160.650 MHz) - BNSF Fort Worth Subdivision Dispatcher (DS-22). AAR 42 (160.740 MHz) - UP Duncan Subdivision Dispatcher. AAR 54 (160.920 MHz) - BNSF Wichita Falls Subdivision (Fort Worth West) Dispatcher. So, come see us in Saginaw. Whether you plan a day-long trip to explore the area's best photo locations or just an hour or two sitting at the Chamber of Commerce parking lot, there's plenty to see. Here's hoping you have a safe and enjoyable and safe visit. And please let me know if you found the information on this web page to be helpful. © 2000 - 2007 by Wes Carr. All rights reserved.